Here’s a shot for those who believe that tourists in North Korea are kept in a little bubble and that everyone we interact with are actors. That’s an awful lot of actors to hire, just to fool 12 tourists!! 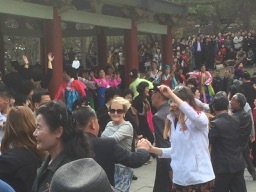 There I am, dancing with the locals with my sunglasses on, looking cool. It was so much fun. I’ve left this site pretty much to itself, but I’ve been blogging about the trip on the other blog. I really want to get this done, so this site has a few tumbleweeds in it at present. I’ll be back! Day 3: Beijing, Dandong and Pyongyang, North Korea. Day 5, Pyongyang continued. The Victorious Fatherland Liberation War Museum. Day 5, continued. Monument of the Party Foundation and the Juche Tower. Day 5, continued. Grand People’s Study House, parks and the Mansudae Grand Monument. Edited to add: It’s now July 5. I’ve ‘only’ got 5 days to go on the trip. Sifting through those photos takes a lot of time. Once I’ve knocked North Kore on the head, I’ll be back here.